Cairo, Egypt; October 31, 2017: GE (NYSE: GE) today announced that it has completed building and connecting the Badr substation in Egypt to the national grid; the Badr substation is located in the north-eastern Cairo Governorate, for the Egyptian Electricity Transmission Company (EETC). The new 500/220 kilovolt (kV) Gas-Insulated Substation will dispatch 1.5 gigawatt (GW) of electricity, in response to increased power generation in the area and secure reliable power supply coupled with minimal losses of transferred power. The Badr turnkey substation, which came online end of September 2017, will play a strategic role in the upcoming Egypt - Saudi Arabia Interconnection. The Project links the national grids of both countries from Badr city in Egypt to Madina and Tabuq cities in Saudi Arabia via a 1,300-kilometer transmission line. The Badr substation will connect 1.5 GW, or 50 percent of the Project's total exchange capacity, which is the power equivalent to meet the needs of more than 1 million homes. With a difference in peak demand times during the day for each country, the interconnection will help secure stable transmission to meet such needs. The substation will leverage GE Power's Grid Solutions portfolio, which includes GE's T155 550 kV and B105 220 kV Gas-Insulated Substations. These technologies meet the requirements of the network in terms of power generation, transmission and heavy industry applications. Furthermore, the B105 & T155 are environmentally friendly, and contain digital monitoring control and protection capabilities that enable them to be readily integrated into the smart grid. 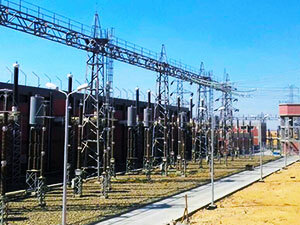 GE is also providing local project management, engineering, design, fabrication, the erection of nine single phase power transformers, site management, testing and commissioning on a turnkey basis. GE will also provide factory and site training for EETC's engineers, as well as the supply of spare parts. This project reflects GE's commitment to making a positive impact on the quality of life of Egyptians by helping provide a seamless supply and transmission of electricity. GE has been a partner to Egypt for more than 40 years; today more than 150 GE gas and steam turbines are installed in the country, generating more than 15.5 gigawatts of power, enough to meet the electricity needs of more than 15 million Egyptian homes.